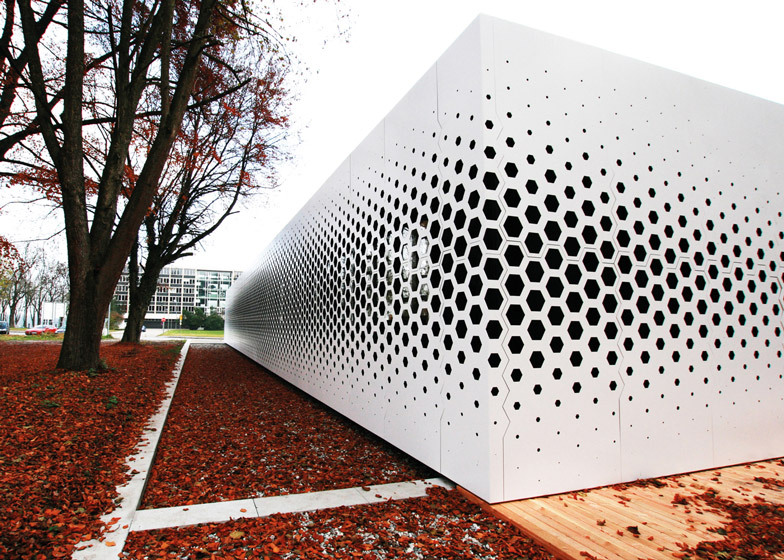 Format Elf Architekten added a pattern of hexagonal holes to the long aluminium facade of this office building in Germany to control the amount of daylight entering the interior (+ slideshow). 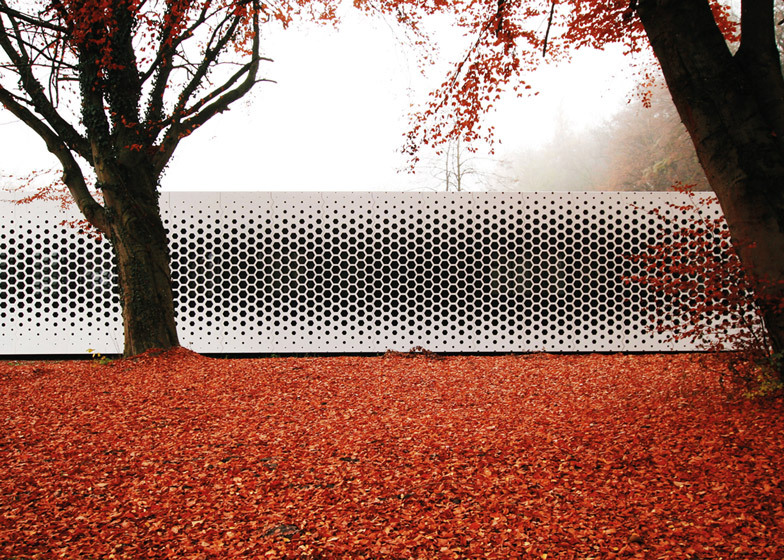 German firm Format Elf Architekten developed a perforated pattern that relates to the amount of shade created by nearby trees, ensuring that minimum daylight requirements inside the offices are met. 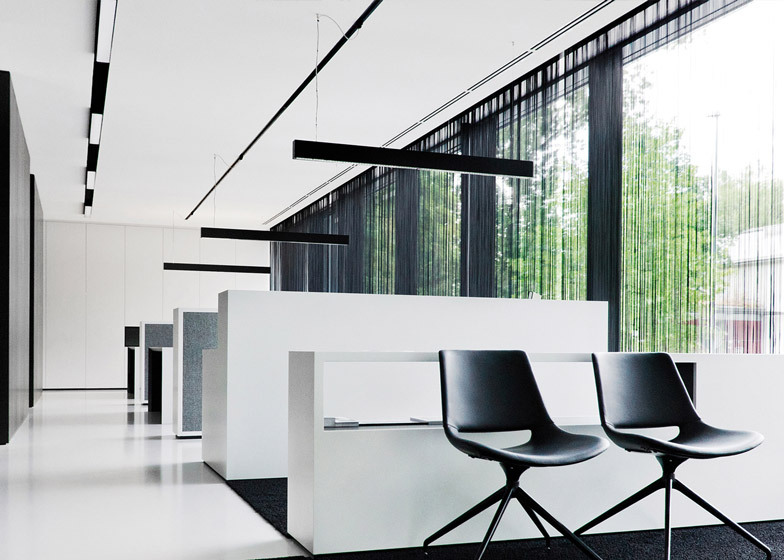 The building is located within an interdisciplinary creative campus called Campus Netzwerk in the town of Töging am Inn, which was once the site of a major aluminium production plant. 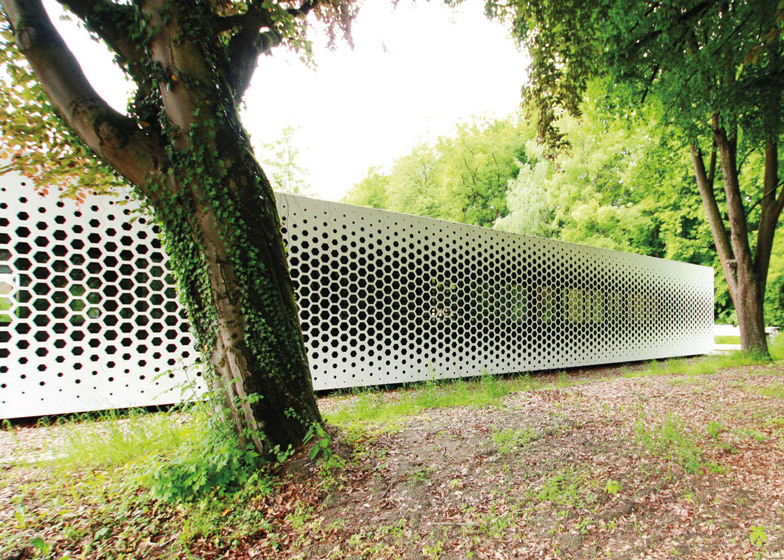 The facility accommodates office spaces and meeting rooms for creative agencies within a single-storey pavilion partially clad in aluminium to reference the area's history. Parametric computer software was used to produce the honeycomb-like pattern that is laser cut into the metal surface. The largest holes are focused in areas that already receive enough shade from the surrounding trees. 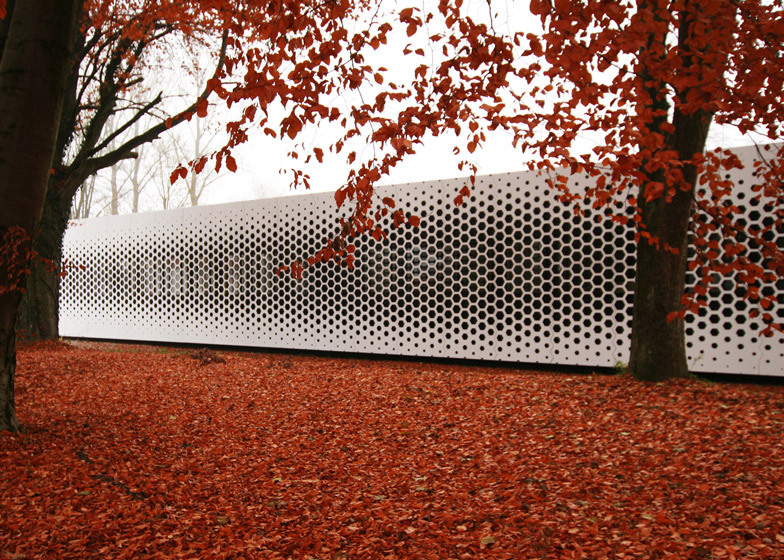 The pattern wraps around the edges of the pavilion and gradually dissipates across the shorter aluminium end walls. Glazing runs the full length of the other long facade, which is set back from the front of the building and framed by a band of aluminium. 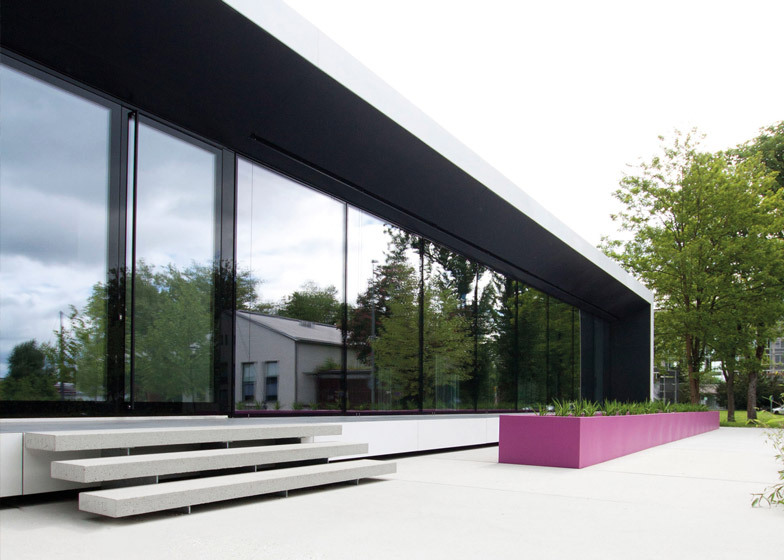 A short set of concrete steps leads to the level of an entrance built into the glazed surface, which is sheltered by the projecting frame. The 400-kilogram glass panels that make up the facade can be extended outwards to create a gap for natural ventilation while retaining the surface's flush appearance. 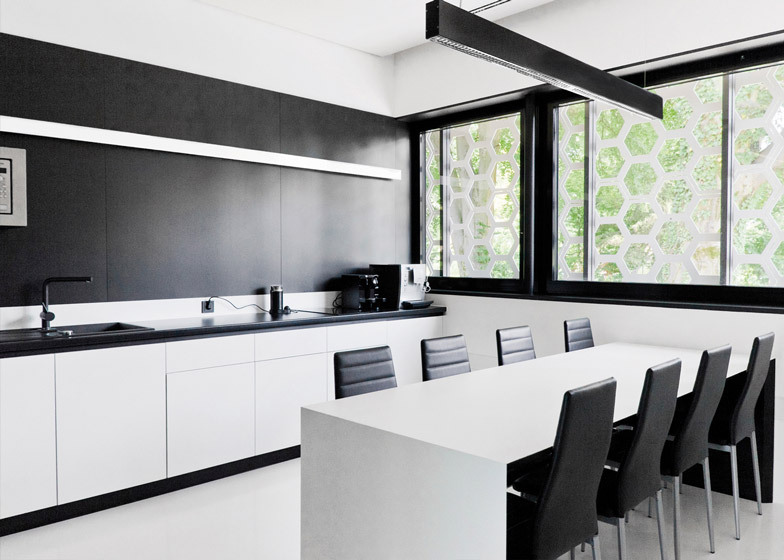 Inside the building, the architects employed a monochrome palette that complements the aesthetic of the exterior, combining white surfaces with black detailing. 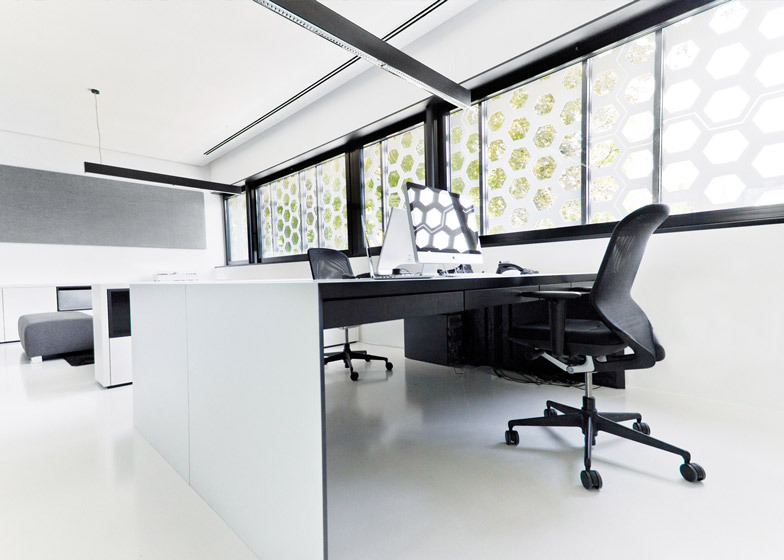 Cubicles are arranged along the glazed edge of the building, while the opposite side of the interior is divided by glass partitions into offices, lounge areas and meeting rooms. 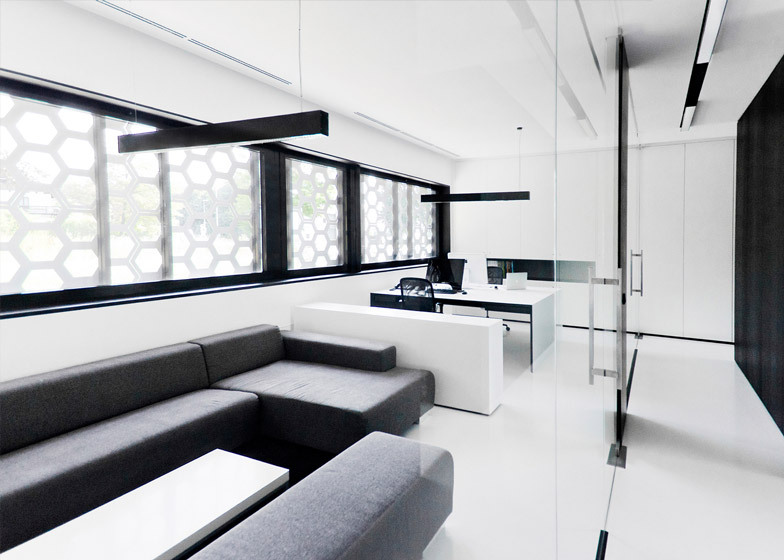 Black cubes divide the space in two along its central axis and contain bathrooms and several more private work spaces. Format Elf Architekten also recently completed a collection of timber cottages that resemble archetypal pitched-roof barns for a resort in the Bavarian countryside. 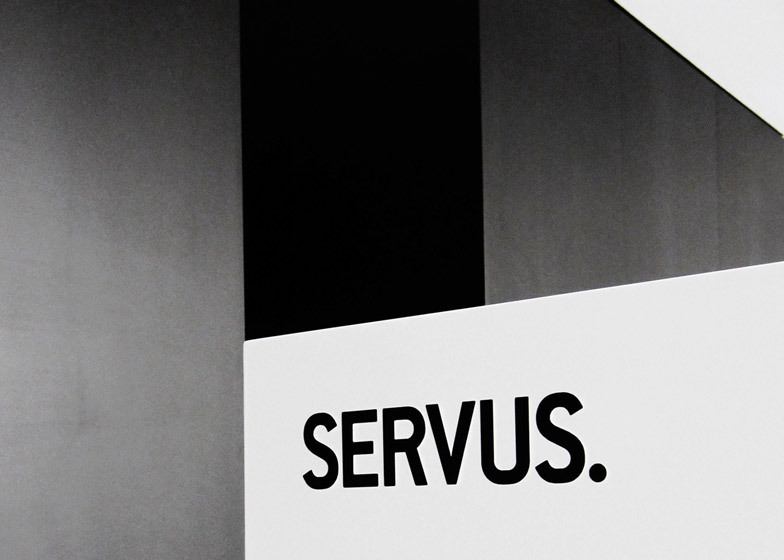 Photography is by Bettina Kirmeier.